This international conference poses a number of innovative topics for the international political scenario, offering a comparison between speakers with a vision both at the global and the national level. The digital evolution needs to define or redefine a number of relations to take into account the evolution of the technological factor. The recent "Paris Call for trust and security in the cyberspace", that IAI co-signed, has highlighted the need to make progress in the international regulation of the cyberspace that represents today a real political space. At the same time, there is a need to guarantee the centrality of citizens, who are becoming increasingly digital, in the age of big data and the challenges of artificial intelligence, to ensure technology would be beneficial for all. 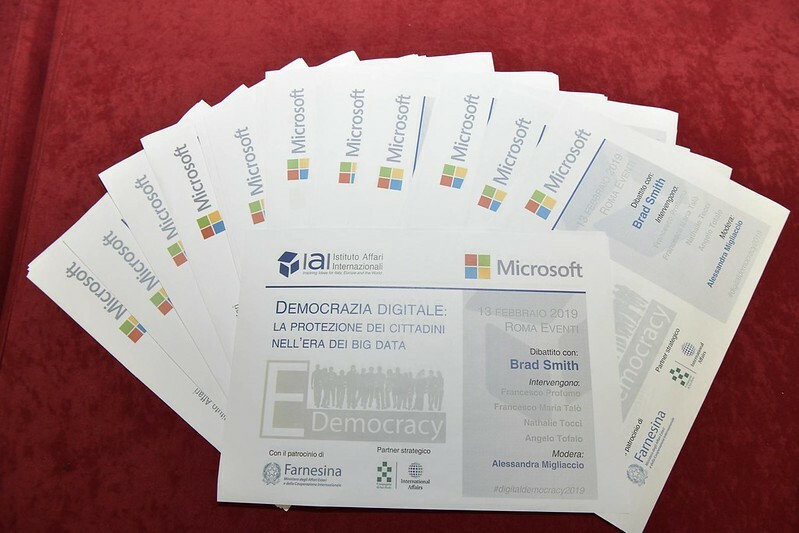 The conference will allow to compare one of the most acute corporate executives worldwide (Brad Smith, President Microsoft Corporation), with analysts (Nathalie Tocci, IAI Director), representatives of the Italian private sector (Francesco Profumo, president of the Compagnia di San Paolo), Italian diplomacy (Ambassador Francesco Talò) and the Italian Government (Angelo Tofalo, undersecretary of Defense). The objective is to advance the knowledge of these issues in an Italian context and greater strategic positioning of the country.